Real Estate pages on the Internet. If you are interested in Buying or Selling commercial real estate in Eastern Connecticut, get your mouse ready and start clicking the links above to find out more about one of the most dynamic areas of the country. Our firm’s goal is to provide a personalized, local, commercial brokerage service to regional and national clients seeking to sell, lease or purchase properties. Bondi COMMERCIAL seeks to distinguish itself from other local brokers in two ways: Firstly, by offering the sale or lease of properties or the ability to locate properties throughout the I-95 corridor from Westerly, RI to Old Saybrook, CT, and the I-395 corridor from New London, CT to Auburn, MA. 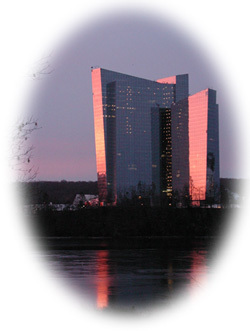 These two corridors have grown and continue to grow in a spectacular fashion due to the growth of the world’s two largest casinos- Foxwoods, and the Mohegan Sun, the continued expansion of General Dynamics (Electric Boat) and the tourist industry. Secondly, by affiliation with the International Council of Shopping Centers (ICSC), the Commercial Investment Division (CID) and the Multiple Listing Service (MLS) of the National Association of Realtors, The Connecticut Economic Resource Center (CERC) and the Southeastern Connecticut Enterprise Region (SECTER)- we offer our clients the fullest exposure for their properties or the widest audience for those seeking properties. Development approvals and entitlements available or readily attainable. Utilities and municipal services available to site. Close proximity to vacation and tourism destinations. 1.New London County: 2-4 Industrial Acres, level and preferably paved. 2. Eastern CT: Stone quarries, preferably with rail. Contact us if you have or know of properties that fit these needs!